A Tracking Number is the phone number that your customers or potential customers will call. Before you can use our system, you need to purchase at least one tracking number. You can purchase local, toll-free, and international numbers from over 60 countries. 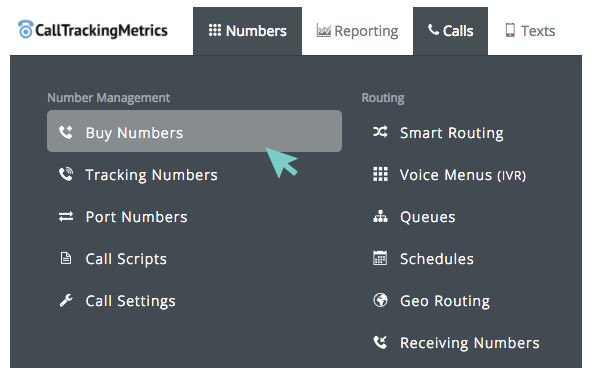 If you already have numbers that you have with another provider, you can port your numbers to CallTrackingMetrics instead. The Receiving Number: this is the destination number that will ring when someone calls the tracking number. This can be an office number, a cell phone number, desk phone number, etc. The Tracking Source: the advertising channel you are tracking with this number. The Target Number: this is the number that is hard-coded on your website that you are going to have our tracking code dynamically replace with a tracking number. 1. Go to Numbers → Buy Numbers. 2. In the “Find Numbers” dropdown, indicate which country you want to purchase numbers in. 4. After choosing your search option, click “Search.” A list of available numbers will be shown below. If there are no numbers available, you will see a message with no search results and a button to “Request a Number…”. You may want to try broadening your search at this point to see if you can find a match. If you are looking for a vanity number, use the “Request a Number” button on the Buy Numbers page. 5. Select which numbers you want to purchase by clicking the “Add” button to move them to your cart. 7. A “Purchase Complete” pop up will appear. You can either purchase more tracking numbers or click “Done” to configure the numbers you just purchased. Note: If you can not find your number you can always Request a number by clicking on the “Request a number” button . This will take you to the Request a Number order form page and then all you have to do is fill out the form and press Request numbers. This request will go straight to our Number Procurement team who should get back to you with in 1-2 business days. Now that you have purchased tracking numbers, it is time to configure them. 1. After you purchase numbers, the next page you see will be a configuration page. You can also configure your numbers at any time by going to Numbers → Tracking Numbers. 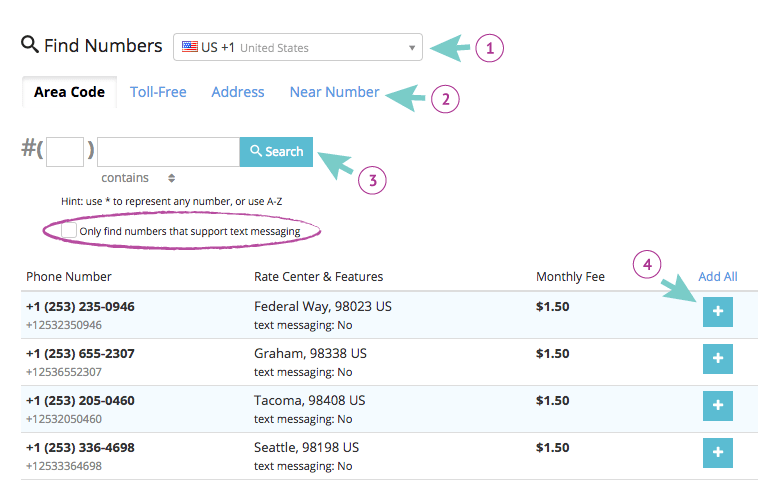 Receiving Number: enter the phone number where your tracking number should forward calls to. Tracking Source: choose the advertising channel you are tracking with this number. You can choose from one of the sources already available in the system or you can type in a custom source name and configure it later. Web Target Number: this is the number you want us replacing on your website with a tracking number (the number that is hard-coded on the page). You can also configure these options by going to Numbers > Tracking Numbers and click the “complete number setup” link in the red boxes next to the numbers that have not been set up yet.